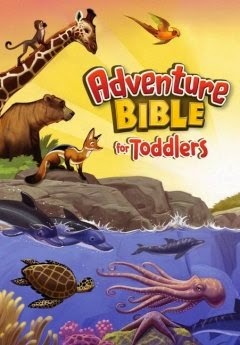 Review: The Adventure Bible for Toddlers is a great starter Bible. The stories are very short, but are a great starting point for little learners who are just beginning to understand the truth found in the stories of the Bible. I like that before the story begins it tells you the book, chapter, and verses the stories were taken from, so you can go back and read them the verses from the Bible or learn more about the story yourself. There are colorful illustrations on every page, depicting the story, and one of my favorite features is that it is a board book! It has a nice plushy cover and back, with board book pages in between. Perfect for small, sometimes messy hands. I will say though I let my baby play with the book and it got a little wet from his slobber, making some of the pages stick and come off a bit. Overall, I think it is a great resource for beginning to share your love of the Bible with your child.